Above and below is a highlight for me for 2011. 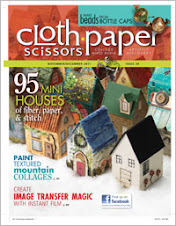 My little house was published in Cloth Paper Scissors! There it is with the little green roof and orange door. This kind of collage and embroidery is really my style! Here I am at a Mixed media workshop I helped run for the Fine Arts Society of Milton. This my collage piece that is being critiqued by my instructor, Jill Segal. I also taught an adult class at the new art centre in October called Art Quilt. Below are three of my students, Sharon, Shelia and Annie. Mary was the also in my class and I enjoyed introducing her to fibre art. My other class was at the Canadian Embroiderers' Guild Guelph. I was teaching The Book of Stitches from the Jan Messent book on Celtic, Viking and Anglo Saxon Embroidery. This is 92 year old Dorothy who put the rest of us to shame with her creativity and work ethic. Her book of stitches was completed at the end of six weeks. Ellen, a retired teacher enjoyed the class as well. Barbara Lee, below, created a very beautiful accordion book! I taught a children's art class at the Milton Centre for the Arts for 10 weeks. ( once a week ) We had a delightful art show of all student's art work at the Holcim Gallery in December. Whew, it was a chaotic season! Did I mention I taught at my friend's Open Studio, did Studio Tour with the best sales ever and fitted in a few supply teaching days? I did make a bit of art in the evenings watching television to sell at the AM Gallery. I continued to do the Sketchbook challenge each month, even if it was only one sketch or collage. Its two hours into the New Year and I will not be making New Year's Resolutions. 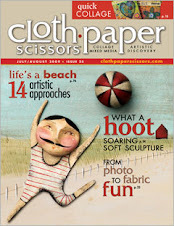 I will work at addressing my intentions for 2012 which will include my passion for all things fibre and stitch and mixed media. Happy New Year to you too and I'm happy to see you back in the blogging world. I've been bad too because of work issues, but seem to be back on track. Let's hope we get a chance to get together sometime soon!! Happy 2012 to you too! How I wish I could have taken your class based on Jan Messents book - it is my absolute favourite in my collection and actually I did a blog post about it just recently. Cheers! Great to see you back on the blog! I've missed seeing you both in person and on the blog but hopefully that will all change. Happy 2012! What a lovely journey through your year Donna. You really put me to shame with what you manage to pack in to your time. Have a wonderful creative 2012. Congratulations Donna, your house is beautiful and was well deserved to be featured. Happy new year see you soon !!! particular part and do each of the calculations for you automatically.